The drugs were concealed in household linen. CANNABIS WITH AN estimated street value of €60,000 has been sized in Tralee, Co Kerry. During an intelligence-led operation conducted by Revenue, the Garda National Drugs and Organised Crime Bureau and the Tralee Garda Drugs Unit, three kilos of herbal cannabis were seized in Tralee town this morning. The operation is part of ongoing joint investigations targeting drug importations in Tralee. 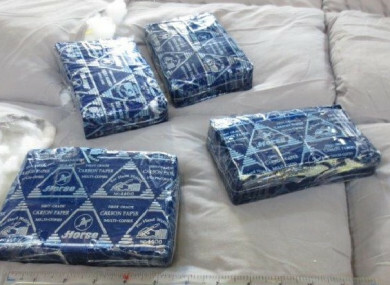 The illegal drugs originated in Thailand and had been concealed in household linen, Revenue said. Gardaí arrested two men, aged 43 and 27, who were brought to Tralee Garda Station for questioning and are being detained under Section 2 of the Drugs Trafficking Act. Investigations are continuing with a view to prosecution. If businesses or members of the public have any information about drug smuggling, they have been advised to contact Revenue in confidence on 1800 295 295. Email “€60,000-worth of cannabis from Thailand seized in Tralee ”. Feedback on “€60,000-worth of cannabis from Thailand seized in Tralee ”.